My first Car Share. Ric navigated and pointed out the red lights. I ever owned, we have not once regretted being car-less. But sometimes you cannot get where you want to go by public transportation: perhaps a special museum, a lake, or a picturesque small town. Or public transportation takes too long, turning a quick trip to IKEA into a 4 hour marathon. A few times we have rented cars from Hertz for a few days, but we have to pick the car up by Noon on Saturday and cannot return it until 8:30 Monday morning. So we end up paying for a car for 2+ days, €95-€130 when all we really needed was a car for half-a-day. 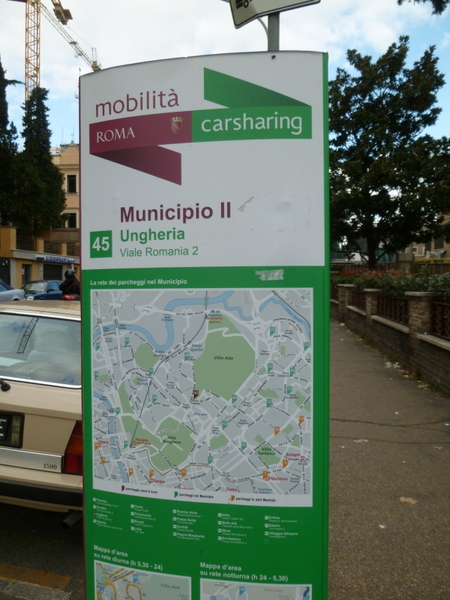 Now we have Car Sharing Roma. 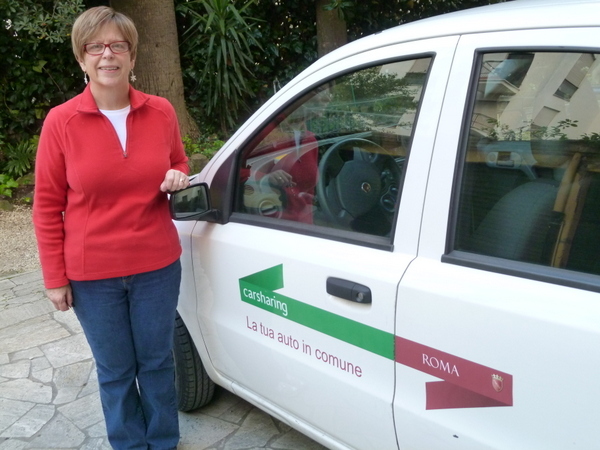 Like Zip Cars in the U.S., one obtains a membership and pays a small fee per hour and per kilometer to use a communal car. It took a few weeks, a 12 page contract in Italian, several on-line transactions, and a trip to Poste Italiane, but we were successful. Today we took our maiden voyage and it was smooth sailing. My little Car Sharing card opened the door to the reserved car (only a 10 minute walk from the apartment), and other than being swarmed by motorini drivers at one point on the GRA (Grande Raccordo Anulare), it was smooth sailing. The up front cost is about the same for the first year as two weekend rentals from Hertz, so it’s a no-brainer. Plus you can borrow a car with little or no advance notice, any time of the day or night. Looking forward to more weekend outings in-and-around Rome and Lazio, because sometimes you just need a car. Our almost-neighborhood Car Sharing point. ← Kilograms, centigrade and convection, Oh My! Ciao PN! Thanks for stopping by! Yes, the Poste Italiane part scared me most of all, so I delayed going for three weeks. After all, most of the branches close at 12:30 or 12:45, so one has to work at finding an office to visit after work. But after a 15 minute wait, the nice lady there put up with my Italian and all went quite smoothly. I am blessed! 🙂 Merry Christmas to you. Ciao da Texas! What is the radius for the car? Sounds great. What trip will you take now that you have an available car? Ciao Rebecca. I don’t think there is a limit on how far you can take the car, but you are limited to 60 days when you reserve. Doesn’t seem to me that would be economical – even overnight would really not make sense. We will take trips to little villages and rural locations for hiking. One we have in sight is Civita’ di Bagnoreggio. I’ll post here, no doubt! a’diammo Laurel (Hope I spelled it correctly). I enjoyed public transit throughout Italy but really really really enjoyed having a scooter in Rome. I don’t know how practical that would be on an ikea run LOL. I really enjoy all of your posts dear Laurel! We just finished shoveling the drive and sidewalks….12″ in 3 hours. That’s huge for south NJ! Bella Sharon, You are a braver woman than I if you rode a scooter in Rome! I would be terrified! A car is bad enough. US weather seems bad from coast-to-coast. Take care of yourself! Carissima Terah,We are hoping to see Papa Francesco New Year’s Eve. Not sure I would ride a bicycle in Rome with the traffic! Two things … I forgot to comment, but I really enjoyed your Thanksgiving post – I even passed the link on to a few other people. Second, it will be interesting to read how often you actually need a car versus public transit. I like to think of Europe as being a mecca for public transit, but also understand your point that sometimes it doesn’t make sense. Ciao Will! Glad you liked our Thanksgiving report. We certainly had fun! I think we will rent a couple of times a month just to get to more rural locations, tiny villages that appeal, and maybe to do some hiking. We also use cabs once or twice a week when we are out late and too tire to wait out public transportation. Buongiorno Carolyn! I expect we’ll rent a car for 3 or 4 hours a couple of times a month, now. Anxious to get out and see some of the stunning small towns in Lazio. Still loving the trains for big trips. Your weather looks frightening! Stay safe! Technology and having wheels – a wonderful thing! I’ve so enjoyed reading your blog over the last several months. After three glorious months of travel all around the US visiting family and friends, I’m home for Christmas! I will email you with all kinds of newsy news in the next day or so my friend. Have a very Merry Christmas and I know a glorious New Year is awaiting us all. Keep those data bursts coming. Ciao Barbie! I’ve followed your travels on Facebook! You did get around! I look forward to your newsy news!